Isabel Speer, displaying her National Champion Jersey. We all have memories of seeing superstar athletes receive awards. As we watch them get introduced and do the steps towards the top of the stage, we all know that there was a dedication and innate talent that lead to that moment, and we all hope beyond measure that this one athlete will have a one paragraph delivery of words that will inspire us or, at the least, allow us to enjoy their successes with them. In the movie, Rocky Balboa screams out of his wife’s name, “Adriane,” most unforgettably, as he desperately tries to connect her to his moment. We all want to be someone’s Adriane. Sometimes, we connect when we see an athlete lifting up their children after the end to a season or match. That act of normalcy grounds us that these people are as human as the neighbor down the road whom we only wave to as they drop by us at the end of each work day. Despite whatever rules were broken on and off the field of play, none of that matters as the athlete changes roles to that of mother, father, spouse or child. It is beyond rare than any of us ever get a glimpse into the background that leads to a regular person getting labelled a “Champion.” And, if we get honest, there is inevitably a dark story embedded in there. As I talked to Isabel Speer a week ago to get her story, I got emotionally levelled each time I tried to synthesize my notes with the need to put something in writing that might inspire us. I have my dark story, and it remains hidden to all but a select few, and, after pondering, it really doesn’t empower any of us when we hear it. I want Isabel to be remembered as an athletic hero and occasional overcomer, not like Rocky Balboa. Imagine spending a childhood in the shadow of the most powerful force on earth but without the ability to understand what is going on. I think that is what life might be like if I, too, was raised in Mexico but couldn’t speak English. Sure, others could help translate for me what the US or Canadian presidents were saying, or what an American athlete was talking about in their post-game interviews, but I would still feel lost. It is like being on a desert island with a radio that only broadcast in a language that I didn’t understand. To complicate matters, Isabel got told, “no” when she tried to compete. She recalled that as she ran around her school on the playground, no one could catch her, not even the older kids, when she was age 8. When a coach came to the school to hold a tryout for the cross-country and track teams, she felt that she was sure to be invited to join the team. As the coach read the names of the 5 children selected, she didn’t hear her name announced. To emotionally complicate the moment, her best friend’s name was read as one of the 5 to make the team. After a short spell of sadness, Isabel did something most bold. She took the title of “6th girl” and went to the team’s practices anyway. Her wild-card gift came not from another athlete or coach, but from another athlete’s mom. Another girl’s mom didn’t like the responsibility of bringing her daughter to and from practice each week, especially on Saturday, as that was her day off. The coach, who thought he had done a good job at saying, “no” to Isabel, also did something unexpected, as he tried to find a place for her on the team that didn’t involve the skills that she had previously tried out for. He saw that even at 8 years old, she wasn’t going to take his failure to put her name on the list as his “final answer.” He kept her there, and he sought a place to put her on the team. He tried her at long jump and at hurdles before a spot formally opened up for another runner, and Isabel joyfully stepped into the opening. And run she did…all the way to Columbus State University on a Cross Country Scholarship. That single moment of courage she exercised at that young age led her down a path that she could not have predicted. She loved to run, and she practiced it enough to get good at it. But not in her craziest of thoughts did she think it could take her to a place where she could wear a TeamUSA uniform and have the honor of representing the USA as its National Champion…after all, she was and is Mexican, by birth! At the awards ceremony at Nationals a few weeks ago, I listened to USAT’s leader call the names of the athletes who had done something special at the event that wasn’t listed on the printable results documents. She and I had talked right before the race and again afterwards, but we didn’t really talk about the race. We talked about the other things in life…our church stuff, families and craziness of travelling to St. Paul to a race that had the course change due to flooding that year. Of course, we prayed together. She turned back when this was announced and looked at a couple of us. We all clapped as she stepped towards the stage to receive her award. Over the next 15 minutes, her name got called a couple more times. 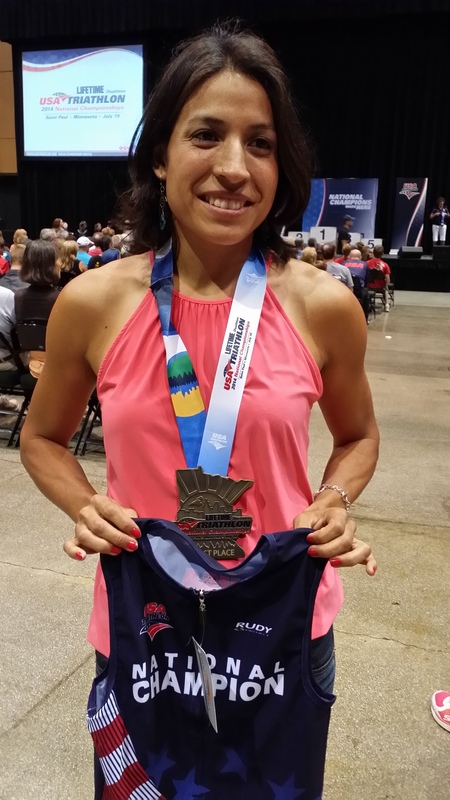 Fastest woman, overall, in her age group, and 3rd fastest woman, bike and run combined in the country…all ages combined. A couple of us joked with her that she a walking advertisement for a sporting goods store, as she had so many different prizes that she had taken down from the stage. During the act of sport, there is a moment or moments that all champions get a fire alit in the deepest parts of their being. The adversity of their past and their circumstance run headlong into their skill and focus. It gets labelled as joy and love for the sport, and to be fair, those are accurate labels, but sport often is a tool to address our inadequacies, and, in more instances than we can count, be one of the few places on Earth when an athlete can say, with a straight face, that they belong. Athletes are the victim of unplanned tragedy at the same rate as everyone else on Earth, but their mechanisms for handling and coping are not shared with the same frequency. As she and all of us prepare to represent the US in Australia next year at the World Championships, she shall travel with her ghosts in tow, just like the rest of us. And, just like me, she will carry a picture of her family, as they stay home and live a normal life while we board a plane to travel to a far off place, to run and ride with the best in the world. When we race, all personal inadequacies are washed away, and we are purely in the moment. We all see the commercial about the football player who was arrested for this or that, only to be playing the next weekend, and when the camera zooms in on them, they carry the competitive look into battle, and no lawyer or judge can change their focus on the game in that moment. “There are no barriers for me when I am out there (racing). The only thing I can control is my performance, and I love that.” Most of life, we lack the ability to control the outcome. On race day, in an endurance sport like Duathlon, all of us run and ride our individual races. It just so happens that we are all doing it, at the same time, on the same course. It is like bowling, and each bowler has their own lane, but we all go to the same bowling alley. As a 5k specialist in college, she could break the 18 minute barrier and turn a consistent sub 6 minute mile. Her best road race time was 17:29. “Right after I got on full scholarship at Columbus State, my dad lost his job. Had I not got that scholarship, at that time, I don’t know what I would have done.” God’s timing goes beyond human understanding. I am proud to call her a peer and friend. That she also happens to be a hero of our sport is just a plus. It creates a drive in all of us to tell her story, as it can only inspire. Her dark stories are no different from anyone who lives in Middle town America. What is different is what she did about it. She is our National Champion. National Champion! Sounds nice, doesn’t it? Previous postDuathlon Nationals, 2014: Family included.